Stanley Vosburg is an artist with a unique and warmhearted approach to aviation art. 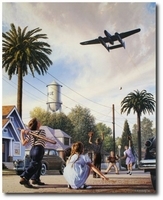 His limited edition print series, "Home Front Aviation", embodies a nostalgic look at America's love affair with military aviation during the 1940's. Stan's realistic narrative style and impeccable historical fidelity, make his period paintings a window into one of aviation's most exciting eras, --a shared experience for airplane lovers of all ages. Vosburg is a native Californian, born in Richmond during WWII. He is a professional artist, and a retired stress engineer from the defense industry. What began as a hobby in high school has become a serious vocation. Having taken oil painting classes at Fullerton College in the late 1980's, and encouraged by members of the American Society of Aviation Artists (ASAA), he began producing and marketing limited edition prints of his works in 1995. Stan is presently working on a series of paintings depicting the impact of military aviation on the people who lived and worked on the Home Front during the decade of World War II. One of these works, "Impressing the Night Shift", was recreated in "living art" during the Laguna Beach Pageant of the Masters' 1999 millennium season. 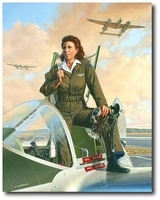 In 2008, Stan's latest painting, "Lightning Lady", won the ASAA award for Women's Contribution to Aviation and third place in Aviation Week and Space Technology magazine's annual art contest. Stan and his wife Cheryl reside in Orange, California, where they share time between his two careers, and their four grandchildren.